Are you planning to hire an interior designer to spruce up the look of your living or bedroom space? Simply paste this Aquire Decals wall sticker on any chosen wall in your house and add beauty to the space without spending a fortune. Natural Theme This rectangular sticker has a natural theme. 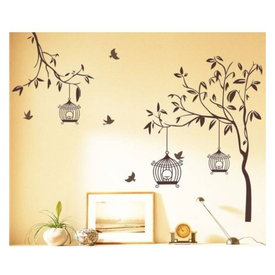 The trees, birds and the cages will liven up your wall. Made of PVC Vinyl The sticker is created out of high-quality PVC Vinyl which makes it durable and economical. It is non-toxic so you don’t have to worry about keeping it away from your kids. And, if the sticker gets dirty, you can easily wipe it off using a wet cloth. Are you planning to hire an interior designer to spruce up the look of your living or bedroom space? 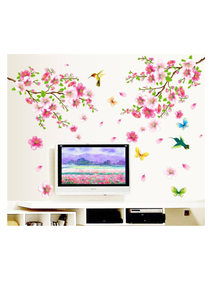 Simply paste this Aquire Decals wall sticker on any chosen wall in your house and add beauty to the space without spending a fortune. Natural Theme This rectangular sticker has a natural theme. The trees, birds and the cages will liven up your wall. Made of PVC Vinyl The sticker is created out of high-quality PVC Vinyl which makes it durable and economical. It is non-toxic so you don’t have to worry about keeping it away from your kids. And, if the sticker gets dirty, you can easily wipe it off using a wet cloth.